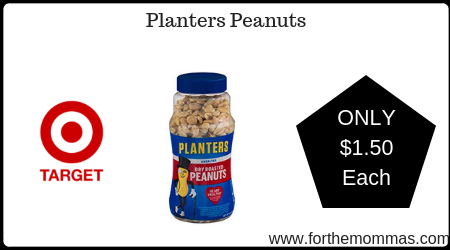 Target: Planters Peanuts Just $1.50 Each Thru 2/2! Target is offering Planters Peanuts 16 oz on sale thru 2/2 for just $2.50 each. We also have a $1/2 Planters Peanuts coupon insert available to stack with this deal. Stack it all with an Ibotta Rebate that will make the final price only $1.50 each!